The Heading Element helps separate the different sections of your web pages, just like chapter headings and subheadings do in a book or article. They break up large chunks of text and make your site easier to read. They also play a role in SEO, because they help search engines understand what your website is about. 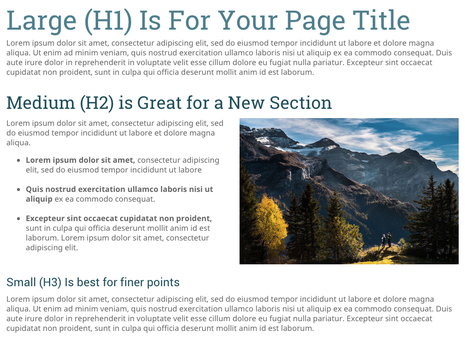 Choose between Large (H1), Medium (H2), or Small (H3) headings. Adjust the style using the Style Editor. You can choose different font settings for your Large, Medium, and Small headings—but keep in mind that you want them to have a consistent look and feel. Put one (and only one) Large Heading Element on each page. This will be the main topic of your page, and might actually be the same as your SEO Page Title. Use Medium and Small Heading Elements to break up the rest of your text into smaller sections. Just a few will do the trick, depending on how much text you have on your page. Note: Make sure you use an actual Heading Element rather than just making your text bigger in a Text Element. That way you won't miss out on the SEO boost that Heading Elements can give you.